The Flash explores the criminal underworld when Barry and Ralph pretend to be bad guys to get their hands on tech that could help them stop Cicada. There’s definitely a pattern emerging in episode setups at the moment. Cicada is still a looming threat and there always seems to be a MacGuffin that might help Team Flash stop them. In all cases that MacGuffin is hard to come by and becomes the basis for an entire episode. The constant need to break from the Cicada plot through telling a story tangentially related to stopping him while having nothing to do with him clearly shows that there is nothing new to be gained from Cicada. The setup is that the Metahuman cure won’t be instant so Team Flash have to find a way to subdue him long enough for the cure to take effect. This is where the MacGuffin comes in and in order to get their hands on it Ralph and Barry have to pretend to be criminals to track down its whereabouts. In concept it isn’t a bad setup as it forces Barry to wrestle with the complicated moral dilemma of the ends justifying the mean and understand that being morally upright isn’t always easy. Ralph occupies the other side of the argument. He sees stopping Cicada as a paramount priority and appears to be entirely comfortable with getting his hands dirty in order to make that happen. Barry initially sees his point of view but struggles with actually going through with it the deeper he gets into the criminal organisation. This starts when the existence of cop killing guns is brought to his attention and he tries to buy all of them so that they don’t get sold to the wrong hands. Barry’s reaction to this shows how naive Barry is when it comes to understanding criminals. He clearly thinks buying the entirety of this particular merchant’s stock removes the problem of these weapons completely but he fails to consider that there are most likely others stored somewhere. It’s also a very small gesture in the grand scheme of things considering everything that is being sold around him. I’m not saying Barry being naive is a bad thing, far from it. It’s actually consistent with the character that has been developed since his first appearance in Arrow all those years ago. In many ways he hasn’t scratched the surface of Central City’s criminal element as The Flash because he has been more concerned with reactively helping people, dealing with Metahuman threats and handling whatever annual big bad crops up. It’s a fairly full existence matching what Barry has chosen to prioritise as a hero which means he doesn’t understand everything that goes on. This also matches working in forensics for the police. It’s a very reactive job where he’s called in to analyse a crime scene after something has already happened so he has little experience looking into more persistent problems. This makes for another interesting contrast between Barry and Oliver. From the beginning Oliver tried to be proactive through dealing with a list of corrupt people within the city. As time went on he reacted to things that were happening within the city but on the whole he tries to be prepared for everything that comes his way. At this point this still isn’t Barry and they makes for an interesting character flaw as he still has a lot to learn about how his city works. One thing that the CW superhero shows consistently struggle with is a sense of place. Black Lightning largely does very well with its worldbuilding and Arrow certainly has its moments but The Flash has consistently struggled with this. Central City rarely feels like a fully formed city with its own identity. For the most part it’s just a place where stuff happens Exploring the criminal element outside of the threats that Barry typically deals with is a good way to add substance to the city. We did have this to a lesser extent with Amunet Black previously but this is a more concrete look at how organised crime is set up in the City and lays the bedrock for an ongoing problem that the show can keep dipping into in the future. Arguably a persistent organised criminal underworld regularly selling dangerous weapons is more dangerous in the long run than one serial killer. Of course both are terrible problems but it’s curious that the show strays away from pointing this out. This episode should have been an eye opener for Barry when he realises that there’s this whole side of Central City that he didn’t know about. It feels odd that he is able to go back to his life and continue to ignore it. The attempted moral debate plays out fairly predictably. Ralph trying to ensure that Barry doesn’t end up getting his hands dirty is as expected and having him realise that he can’t go through with it either because the crime involves stealing a 3D printer tasked with printing organs for sick kids. It gets the point across about Ralph’s growing sense of responsibility but it’s really on the nose. It does lead to a really cool laser quest sequence where Barry and Ralph tear through the criminals with laser guns set on stun scored to Rob Zombie’s “Dragula”. It’s a different sort of sequence to what we’re used to on this show and really refreshing to watch. I could have done without Barry learning that there are other ways to fight without powers on the back of this sequence though and the fact that they come back empty handed makes the plot itself feel somewhat superfluous. Goldface (Damion Poitier) makes for an engaging villain. He’s cheesy and intimidating in the right ways. Poitier plays him just the right amount of over the top and does a really good job switching from semi friendly yet cautious businessman to intimidating killer when the episode calls for it. 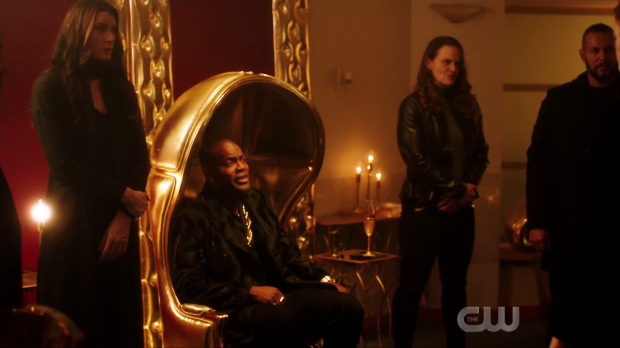 I feel like Goldface is the sort of character the writers were going for with Amunet and failed to do so hopefully he will take her place as a recurring menace. Another moral debate is completely sidestepped relating to the Metahuman cure. Despite being the one championing the fact that Metahumans should have the right to choose whether to be cured or not, Caitlin is entirely behind the idea of curing Cicada. No protest is ever given and she actually seems enthusiastic about using the cure on him which is a complete departure from her stance only a few episodes ago. This is disappointing as the moral debate was definitely worth having and hasn’t been given full attention before now. Sadly it doesn’t look like there will be a nuanced discussion about Metahuman rights in relation to the cure anytime soon. Using Cicada as a case study for that debate would be perfect as well as he could be an example of Team Flash deciding that someone is too dangerous to keep their powers with the obvious counter of what defines too dangerous and what gives them the right to make that determination. It’s all potentially strong stuff and the episode doesn’t even go near it. It’s a rare episode that finds a consistently strong use of Iris. Her return to journalism has been very much in the background up until this point without impacting the main plot too significantly but this episode makes use of her being in that role in a really significant way. Investigating Cicada is sort of a given for someone in her position but it’s the way she goes about it that’s so good. She tracks him down on her own and comes up with a flimsy yet accepted excuse about researching lead in the pipes. It’s enough to get her a sit down with Cicada in order to scope out his current situation. It’s a brilliantly tense collection of scenes with added urgency being created through Iris’ attempts to leave being countered by Cicada buying into her fiction. His pursuit of her when he sees through her deception is a bit over the top but still produces the desired effect of feeling dangerous. Iris using her wits to escape and learn Cicada’s injury based weakness is a great showcase for her character and will become really important when it comes to Cicada’s overdue defeat. This is exactly how Iris should be used to greatly enhance the show. It gives her a definable role outside of the other characters and makes excellent use of her journalism. 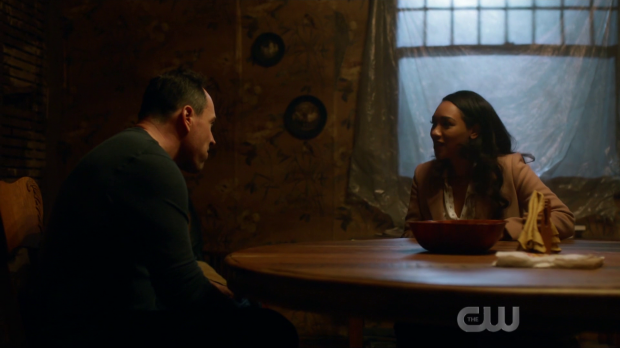 Sherloque’s investigation of Nora continues to gain traction but Thawne advised her to throw him off the scent by distracting him with a woman. The chosen distraction is the Earth-1 version of his ex-wife Renee Adler (Kimberly Williams-Paisley). At first he screws it up by being overzealous and coming across as a creepy stalker but with a bit of time and a consultation with the council of Rene Adler’s he gets on the right foot with her and love starts to blossom. The idea of Sherloque marrying the same woman from different Earths is either hilariously tragic or tragically hilarious and makes a lot of sense considering what we know about the character. I found the council of Rene Adler’s to be something of a waste of time as the message to be taken from it was that he should basically not treat her as a mystery and appreciate getting to know someone. The beauty of this plot is that Nora’s motivation isn’t entirely selfish as she does become invested in Sherloque finding love beyond her desire to distract him. It works even better than she thought as learning that the Earth-1 version of Rene Adler is a Metahuman which renews Sherloque’s focus on figuring out a way to stop Cicada. 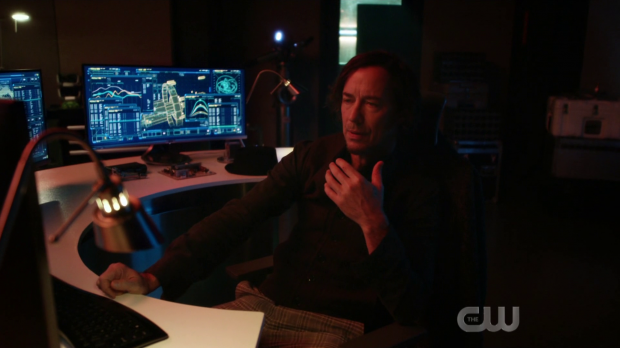 Thawne pointing Nora in that direction further reinforces how manipulative he is though it’s a bit of a stretch that wearing the face of Harrison Wells gives him an intimate understanding of every Wells across all Earths. Then again this is backed up by Sherloque knowing the common traits of Rene Adler on every Earth so it seems that the writers are suggesting that everyone has common traits shared across every version of them. It sort of flies in the face of the alternate universe concept but if the writers are consistent with it then it’s acceptable. A solid episode that continues to kill time on the Cicada plot but uses the opportunity to add depth to Central City. The criminal underworld has been touched on before but never to the extent this episode covers it. It works well enough with the moral debate about the ends justifying the means at its core and the introduction of a fun new -hopefully- recurring villain. 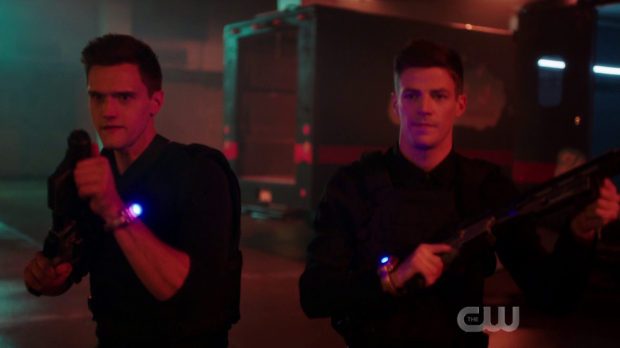 Barry and Ralph playing Laser Quest with criminals and guns set on stun was a fun sequence and a refreshing departure from what the show normally brings. Not everything works such as the fact that the plot ultimately accomplishes nothing and Ralph realising that what he is doing is wrong because the stolen 3D printer would be used to print organs for sick children is unnecessarily heavy handed. The lack of debate over the Metahuman cure is fairly glaring especially with Caitlin having no objection to it. The episode uses Iris really well by making her role as a journalist instrumental in moving the plot forward. She investigates Cicada on her own and ends up finding out about a weakness to exploit. Her conversation with Cicada is amazingly tense even if his pursuit of her when he learns the truth is a little cheesy. This shows how well Iris can be used and gives her a role outside of the other characters. Thawne giving Nora the tip to distract Sherloque with a woman works fairly well as it shows a nuanced approach from Nora who becomes invested outside of her selfish desire to distract Sherloque. The council of Rene Adler’s was a bit much considering the simplicity of the knowledge that Sherloque gains from the conversation but other than that it adds depth to Sherloque.